Suction line accumulator trap that prevents the compressor from taking slugs refrigerant liquid or compressor oil. This is a very simple device that serves a very important function. When fluid is supplied to the compressor noise, high consumption, and most importantly compressor damage, likely to result. Wide or rapid changes in load. There are a lot of steps capacity control or complicated regulation system performance. The use of hot gas defrosting of the refrigerating reel or coil heat pump. Required replacement of the compressor due to the ingress of liquid refrigerant. 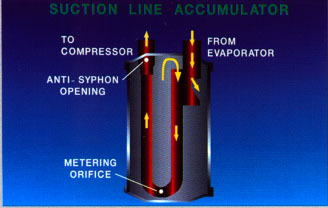 suction line accumulator also serves as a temporary storage of liquid refrigerant chamber for some systems and heat pumps. This is necessary if the system requires different operating refrigerant in the cooling mode, than it is done in heating mode. 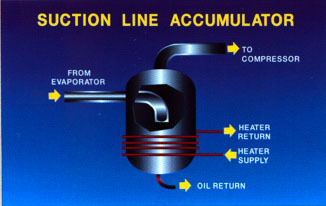 If the original equipment requires liquid accumulators, they are installed by the manufacturer. Split-system sometimes include a factory install a battery in the condensing unit. This is especially true on the model it is assumed that the manufacturer of premium product line. Another time, split systems may require additional battery in the field. If necessary, in the settlements system, batteries, as a rule, on-site installation. Batteries are installed in the suction piping, as the suction pipe of the compressor as possible. 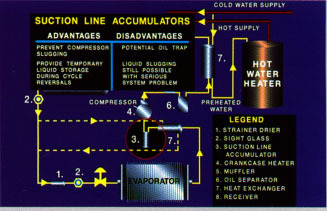 In this place any liquid coolant or oil, which returns in large quantities is trapped temporarily in the battery. 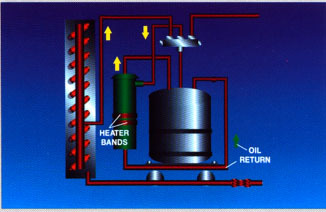 The tube bottom, leaving a battery in this scheme takes the oil back to the compressor. Slugs of liquid refrigerant entering the battery trapped until they can evaporate back into pairs. The evaporated refrigerant joins the rest of suction gas flow and exit from the top of the reservoir. Battery shown here there is a heater in which he was wrapped. Heater speeds up re-evaporation of liquid refrigerant. Not all batteries have such heater. In this model, the suction of the gas coming from the evaporator coil " dummy " in the right top of the battery. Liquid bullets directed against the right wall of the battery casing and run down. Refrigerant vapor enters the tube top and removed to the compressor suction. Dosing hole in the bottom of the return pipe slowly sends refrigerant oil back to the compressor through the suction line. If a heater is wrapped around the battery, re-evaporation of liquid refrigerant proceeds more quickly. Otherwise, the heat of the air surrounding the battery determines the rate of evaporation.